Taylor Beck, we hardly knew you. On Monday, the Edmonton Oilers re-assigned Beck to the AHL, making room for the recall of Anton Lander from Bakersfield. #Oilers recall Anton Lander from @Condors & assign Taylor Beck. Lander scored 21 points (11G, 10A) in 13 games with Bakersfield. Beck was initially brought to the Oilers in mid-December. At the time of his recall, he was the AHL’s leading scorer, with 30 points in 19 games, and it appeared that he had earned a legitimate NHL opportunity. That never came to pass. In two games before Christmas, Beck played a grand total of 9:35, took two penalties, and disappeared into the pressbox. Now he’s back in the minors once again. The 25-year-old probably deserves a longer leash at some point, but unless injuries help him out it doesn’t seem likely that he’ll get it. That brings us to Lander, who had three points and a 57 percent faceoff win rate in 16 games with the Oilers earlier this year. Perhaps more importantly, he was also an integral part of the penalty kill during his time with Edmonton, averaging 2:23 per game while shorthanded. Among current Oilers forwards, only Mark Letestu (2:29) can boast a higher average ice-time. Lander, as is his custom, has been incredibly productive in the minors during his time there. In just 13 games he scored 10 times and recorded 21 points, essentially taking over Beck’s role as offensive catalyst in the AHL. Lander has long been an elite minor-league forward, but aside from a brief window under former coach Todd Nelson he has struggled to convert his AHL scoring to the major-league level. A key distinction between these two players would seem to be that Edmonton’s coaching staff has some confidence in Lander. Beck couldn’t push his way into a more prominent role on five minutes per game, but Lander probably doesn’t need to; he was routinely topping the 10:00 mark in ice-time when dressed by the Oilers. Another important factor for Lander as he tries to keep his NHL career alive is his versatility. He’s a natural centre who can play all three forward positions, one who has scored in the AHL and been cast as a defensive specialist in the majors. That makes him a good fit in the spare forward role. As for the ripple effect in all this, the recall of Lander leaves Jujhar Khaira as the de facto first line pivot in Bakersfield, though the Condors don’t have a lot down the middle behind him. Journeyman Josh Currie has nine points, while prospect Kyle Platzer has had a nightmare of a season. On the wings, the arrival of Beck may have the result of pushing Anton Slepyshev off the top line, though with 10 points in eight games since being assigned Slepyshev has made a case to stick in the role. From a development perspective, this looks like treading water. From an NHL perspective, however, the Oilers have exchanged a player the coaches didn’t seem to have much confidence in for a versatile role player they’re more likely to use. I expect lander to get a few points right off the start here, we’ll all wonder how he made it thru waivers earlier in the year, we’ll all really really – like Henderson really, want him resigned, he will be, then next year we remember he can’t really score and lacks skating ability. Excactly what we know of him now. The real shame to me is we still haven’t drafted anyone more useful than Lander. One great thing about Lander, he does not go to the AHL to sulk…good on him for working hard and hopefully he finds some scoring success in Edmonton. We could always use more secondary scoring. Even if he could replace 1/2 of Pitlick’s production, take some key draws and kill some penalties…that would be awesome. As long as TM is using Lander as a specialist, he should be solid. Faceoffs, PK, limited 4th line duties to start. Maybe he will fit better with the Oilers new emphasis on positional play and puck possession, rather than run and gun. I have always liked the guy and hope he thrives in the NHL this time. Lander would be a good linemate/role model for Caggulia. Lander-Caggulia-Puljujarvi doesn’t seem to bad of a line. The Hendricks-Letestu-Kassian line is to good right now to split up, imo. I’ve had the same thought. It wouldn’t surprise me a bit if Lander is a good mentor. He seems like an intelligent player. I’ll admit it: I really like Lander. He may not be lethal on the offence but he’s solid and seems to make few mistakes. There are times and places for that kind of player. A good 12/13th forward to keep around. I think a big reason Lander is back is for his face off proficiency at over 57%. The Oilers were blown away on the face off vs Vancouver the other day. Its about time they recalled Lander, since he was sent down the F/O% went to near the bottom of the league, the PK suffered all so that coach todd could give a college kid every chance he isn’t willing to give players like Lander and Pouliot. This team needs depth and players like the aforementioned can be the difference down the stretch when the grind really starts to affect the top 6. If Lander gets as many O zone starts as Cags did, I am pretty sure he could at least match his point totals if not beat them since Cags points are coming from the PP and not 5v5. Enough of Lander already….. the guy is slower than a glacier. Sleppy should be up again. 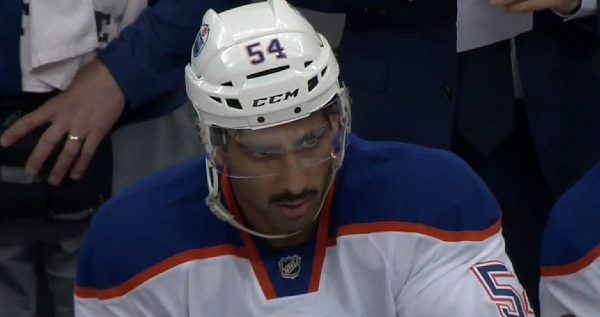 His game suits the new Oilers well. Or maybe even Khaira. He’s played fairly well everytime he’s been here. i kind of agree but we really do need Lander’s ability to win faceoffs, though he doesn’t bring much of anything else to the table. Lander since he plays all forward positions should be given some time with Mcdavid , in a game that is out of control already , we are up big or down big. a bit of confidence and a few points…hey. Granted he is a bit too slow , but so is Lucic. Nothing ventured nothing gained. Lander is the perfect 13th forward. He’s one of the best faceoff guys in the league and doesn’t look out of place on the 4th line. AND his contract is inexpensive and he can effectively kill penalties… I’d be curious to know the production of other 12-13th forwards around the league to see if Lander is comparable. 3 pts in 16 GP this season prorates to about 15 pts over 82 GP. I’m guessing he’s had little to no PP time and not a bunch of 5 V 5 time or offensive zone starts either… (Was also plus 4 before being sent down)… Of course, I think we’d all like more out of a #40 pick overall than a 12-13-14Th forward but considering some of the wasted picks of the last decade at least he can contribute something very needed and positive. In all fairness to Anton, He never plays with offensive skill guys since TMac arrived. I do believe he is capable of delivering more offense then he has. I used to be worried about Lander’s ability to score at the NHL level but Lander only has one less goal then Eberle in the last sixteen games despite Eberle playing almost exclusively with the NHL’s leading scorer. so, trade Eberle? Waive Eberle? Who could we trade Eberle for that would improve the team? Or, play lander on the top line? Or, what does this mean these things you are saying? Here we go again. Every time. No player in the NHL has been sent down and called up more than Lander. He must have a week’s set of clothes on board the Oilers jet. Caggiula and Puljujarvi need to be sent down now to light it up and prove themselves. Bring up Slepyshev.